Several clinical nutrition studies have shown that choosing a low-calorie soup before a meal will naturally help you consume fewer calories overall while still feeling full, and this can lead to dramatic weight loss. More importantly, studies show that soup can help in keeping the weight off once you've lost it. Here's a selection of eight fat-free vegan soups which are also low in calories. Choose any one of these as a starter, or even as a light lunch on its own. 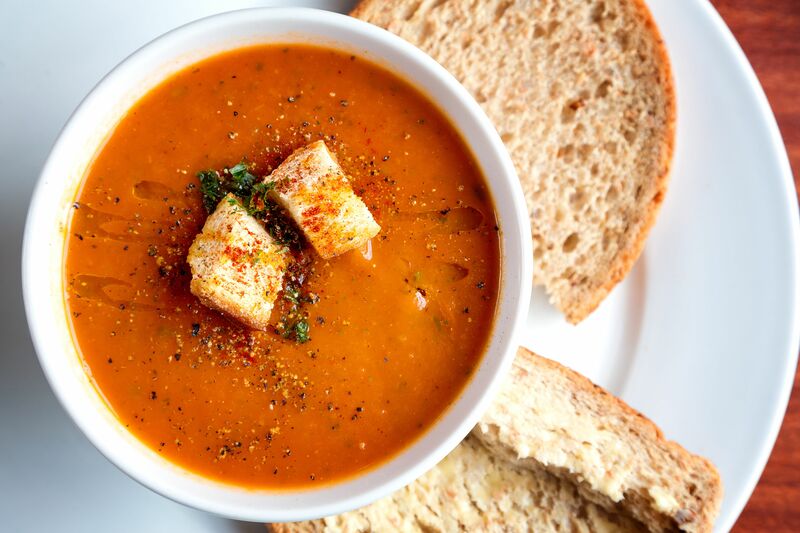 Stop by the farmer's market to pick up plenty of tomatoes and fresh basil, and you can have a satisfying tomato basil soup in just a few minutes using this fat-free and vegan recipe. Many minestrone soup recipes call for beans, which add a small amount of naturally occurring fat. This fat-free vegan minestrone soup recipe, however, fills up with plenty of vegetables - including tomato, carrots, celery, green beans and zucchini - so you won't miss the beans. Omit the macaroni if you want this minestrone soup to be gluten-free as well (of course, then it'll be more of a regular vegetable soup rather than a true Italian minestrone). The flavor from this fat-free and vegan curried split pea and potato soup recipe comes not from oil or added fat, but from using plenty of celery, onions, and seasonings, and the creaminess comes from pureed potatoes. It's surprisingly filling with a hefty about of fiber and protein, so it's perfect for vegetarians and vegans and it's gluten-free, too. Who needs added fat when you can add flavor with bouillon cubes, sage, thyme and bay leaves? This fat-free and vegan split pea and potato soup, made in a crockpot with carrots and celery is filling enough to make a full meal, and completely dairy-free, fat-free and vegan. Omit the bouillon cubes to make it gluten-free, too. This fat-free vegan cabbage soup recipe has absolutely nothing to do with the Cabbage Soup Diet which was extremely trendy in the past, but it is an incredibly delicious soup which will fill you up well. The ingredients are simple: cabbage, vegetable broth, onion and garlic, but the pureed cabbage adds such a richness of flavor that you'll swear it has dairy or added fat. Nope - completely dairy-free, fat-free and vegan. Give it a try.